Integrate our Business Integration Software with Sage, Xero, and Quickbooks accountancy packages to make a seamless process from completing a job to managing your payments. Our aim is to make your Eworks system work effortlessly when it comes to managing customers and customer invoices, suppliers, purchase orders and so much more in an all in one system. This reduces your application stack and ensures a step is not missed. Connect with an easy step by step to sync your tax rates and accounts followed by syncing the sections to follow. The Integration settings let you decide which sections you would like to be integrated. This makes sure your business needs are met when using an all in one system. Upon connecting Eworks with your accounting package, you can sync your customers, suppliers, and products. In the case where you already have those captured in your accounting system or vice versa, there will be no need to capture them in the connecting system. So, with a click of a button, you can sync one with the other. When capturing any new customers, suppliers and products simply select sync and all new information will be synced with your package. When it comes to syncing invoices and purchase orders, once they have been synced and sent out to either your customer or supplier and you update either system of payments made, the status of each will be synced between systems. This means that the connection does all the updating for you. 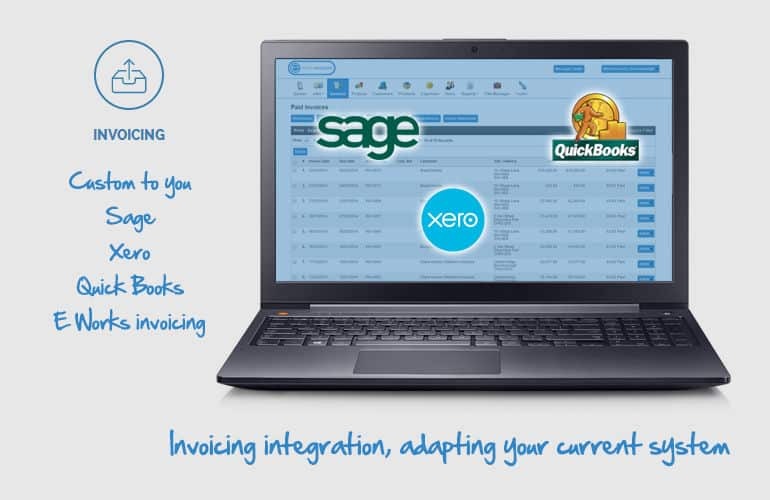 The integration between Sage, Xero or Quickbooks and Eworks ensures the convenience of not having to double capture information or having to operate between multiple systems. It also elevates the loss of important documentation between departments and makes sure all members of staff are working alongside a specific structure to get work completed.